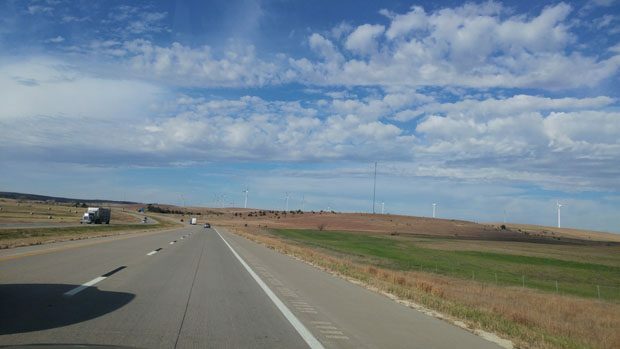 All that empty Kansas plains… except for those wind farms. West of Kansas City lies the Great Plains. There isn’t really much to see along the I-70 in Kansas once we drove past the state capital Topeka. It was hours and hours of grassland or fields, dotted with some wind farms. It was quite windy during some segments of the drive, so those wind turbines were spinning and generating some power. On the other side of the plains lies Denver, Colorado. 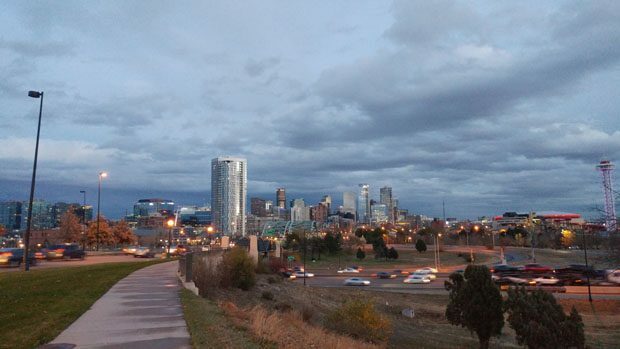 This is the second time in this year that I’ve been to the Mile High City, as I was in town earlier for a conference. 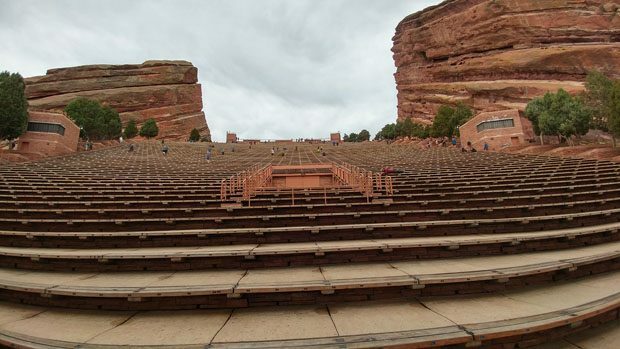 We revisited the 16th Street Mall in downtown for the restaurant and shopping, and also drove out to the famous Red Rock Park and Amphitheater again. There were a few other places in the Denver area I wanted to visit, but unfortunately the weather wasn’t cooperating. There was an incoming snowstorm in the Rocky Mountains, and so we wanted to leave early before the driving conditions became too dangerous. 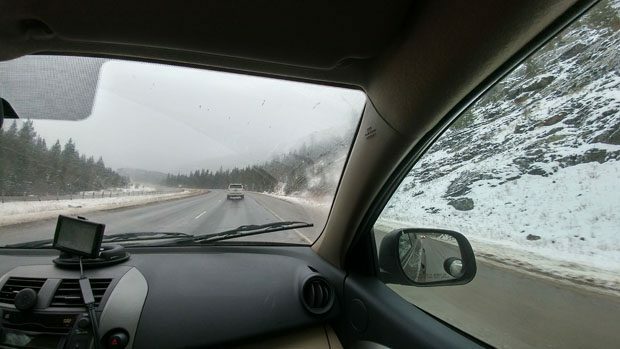 The weather was still okay when we headed out of the Denver area, but then we drove through the Eisenhower Tunnel (the highest point of the US Interstate System) and it was snowing on the other side. The snow wasn’t heavy, but when combined with the hilly, windy roads (by Interstate standards), the drive was a bit tough. Visibility was getting worse, and the road had slippery sections. That was the toughest and most dangerous stretch of the road trip, but we made it through and reached our stop for the night in Glenwood Springs. Glenwood Springs is a resort town in the Rocky Mountains, known for its hot springs. 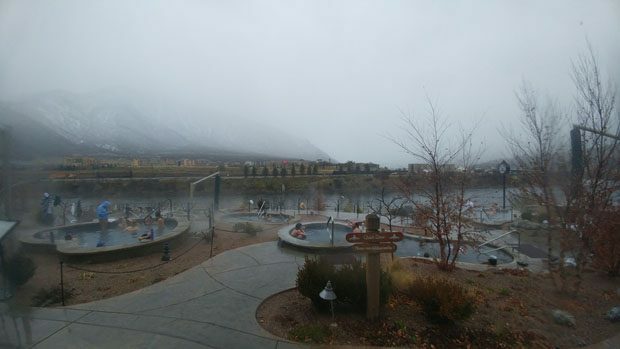 There are two public hot springs in town: the larger Glenwood Hot Springs Resort, which has the largest mineral hot spring pool world, or the Iron Mountain Hot Springs which have a smaller pools. We decided to go to Iron Mountain for the more intimate experience. It was cold and snowing, but there were plenty of visitors… since what else when you are going to do when it’s cold and snowing outside? Walking around in my swimming trunks in freezing temperatures is not fun, but once I got into one of the pools everything was alright. When I get too warm, I just sit up further to expose my arms to the cold air, so it worked out pretty well. Soaking in the hot springs while snowflakes fall on my hair was quite the experience, and not one that I would soon forget. We continued to head west towards Grand Junction, Colorado. The landscape in western Colorado looks quite different than the Rockies: more arid, less trees and plants, and the weather turned bright and sunny. 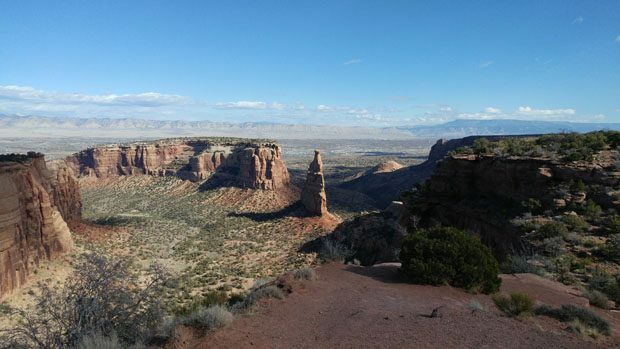 It was perfect weather to visit the Colorado National Monument, which preserves an impressive landscape of sandstone canyons and rock formations located just southeast of Grand Junction. The park is most easily toured by Rim Rock Drive, which is a scenic road that runs along the rims of the canyons. Driving on the rim yielded awesome views of this great landscape of the American West. 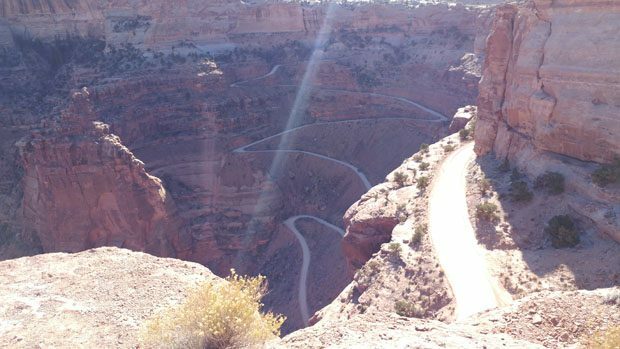 The fact that the winding road is near the edge of sheer cliffs made me drive carefully and slowly, since one wrong move and my car would end up falling into the bottom of the canyon. Taking the drive slowly also allowed us more time to enjoy the scenery. 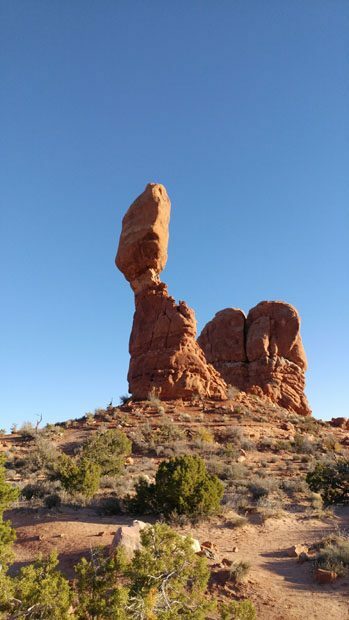 The breathtaking and bizarre landscapes would continue as we drove into Utah to visit Arches National Park. Located in eastern Utah near the town of Moab, Arches National Park is all about sandstone arches, and the park contains more than 2000 of them. 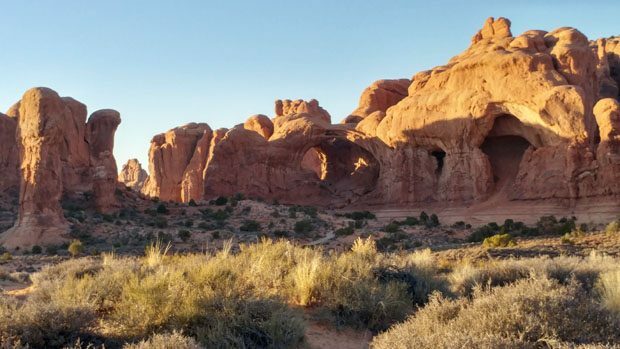 Arches is one of the most well-known National Parks, and even in the non-peak season there were a good number of visitors in some of the popular spots. 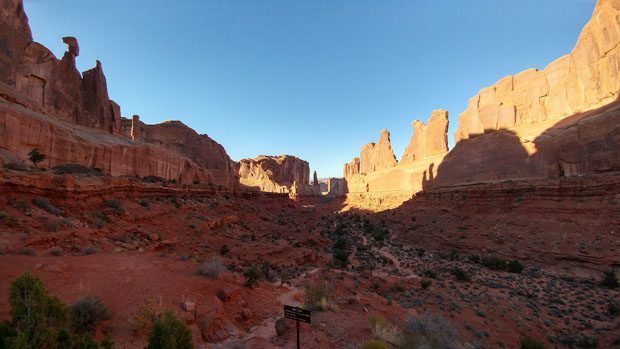 Arches is one of the more well-known national parks, and we heard that congestion and parking are issues during peak period. We were happy to visit during the off-peak season though, and was quite lucky that the weather turned out great. The park has a landscape unlike any other, and in a way it just looks otherworldly. 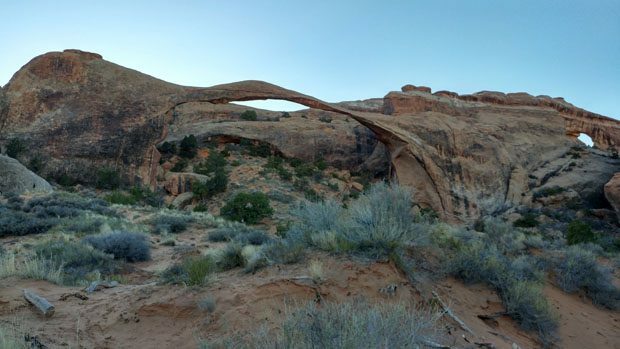 It’s a location that has the right combination of stone, wind, water that causes these amazing natural arches to form. 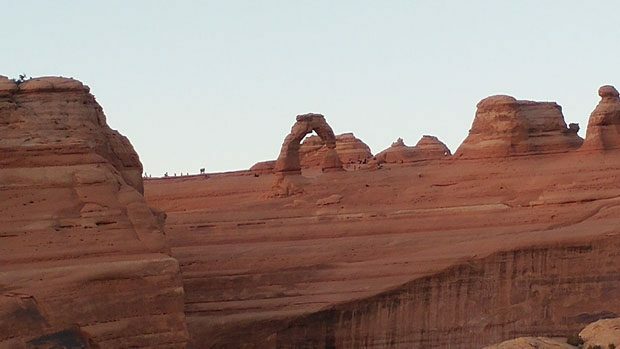 In addition to the arches, there are many other interesting rock formation, all of which are products of erosion. It’s a landscape that has been changing for thousands of years and will continue to change. 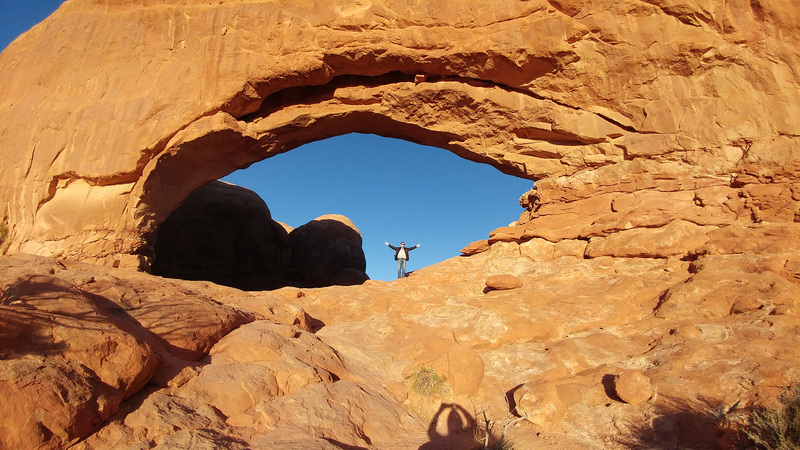 We didn’t visit all 2000 of the arches, but we did see the most accessible ones such as the two Windows Arches, Double Arch, and the Landscape Arch which is the longest one in the park. The most famous one of them all though is the Delicate Arch, which is a symbol for Utah and the image you see on most Utah license plates. We drove to one of the viewpoints and got a far off glimpse at it. Getting up close required a hike which, while not super difficult, was more than we wanted to do during this road trip. There is just so much to see in this park that we still missed some of sights even after two visits. It’s definitely one of those places I wouldn’t mind visiting again. 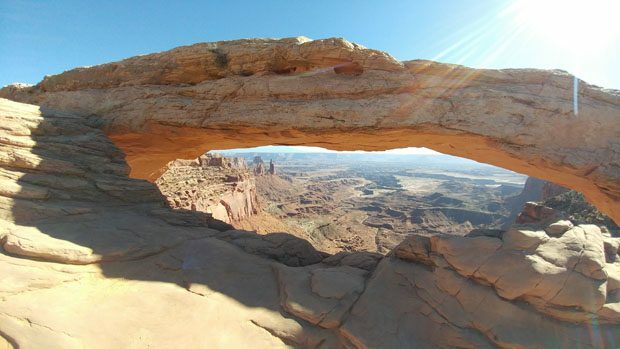 Canyonlands National Park has its own arch in the Mesa Arch. Arches National Park isn’t the only national park in the vicinity of Moab. Just to the west of Arches lies Canyonlands National Park. As you can probably guess by the name, Canyonlands is all about canyons. The most accessible district of the park is the Island in the Sky, which a large plateau that visitors can drive up. Once we were up there, we really felt like we were on an island in the sky, as there is deep and expansive canyon views on all sides. We could clearly see the different layers of rock that form the cliff sides and the levels on the canyon floor. It is such a vast landscape that I couldn’t help but feel small. We saw a lot of impressive sights during our road trip, but the canyons of Canyonlands definitely felt the “biggest”. Utah has three other national parks, each with their own unique landscape, but we didn’t have the time to see them during this trip. 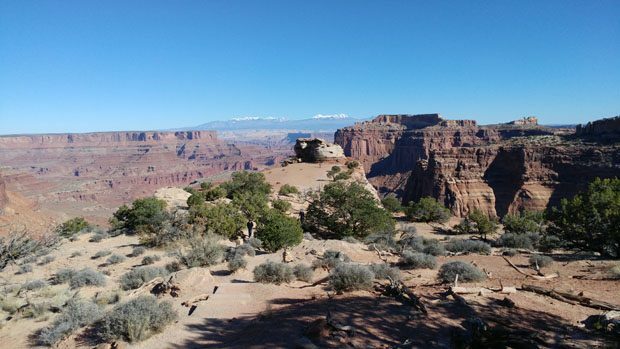 I will definitely be visiting those parks, and also Arches and Canyonlands again in the future. After a few days taking in the sights of the national parks, we continued our journey and head into Salt Lake City. Before getting to Salt Lake City, we drove on a stretch of the I-70 that had no fuel, lodging or food for 110 miles. We drove that stretch of road during the night, and there were very few cars on the road, and sometimes the only light we could see were from the headlights from my car. It was definitely something I’ll remember, since we would have been in big trouble if we ran out of the gas or if the car broke down. The next day, we reached Salt Lake City, the state capital and largest city of Utah. 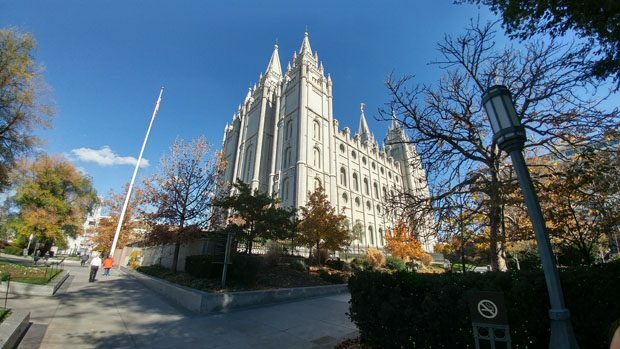 Salt Lake City is also the headquarters of the Church of Jesus Christ of Latter-day Saints (aka the LDS Church), and the church plays a prominent role in the history of the city. 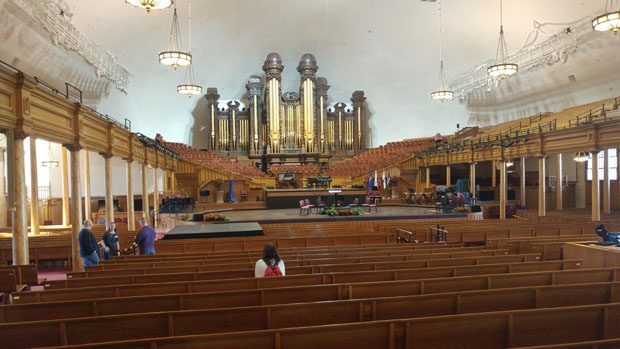 One of the city’s best known places to visit is Temple Square, which is the LDS Church’s primary compound. The centerpiece of the square is the large Salt Lake Temple where religious services are held. The LDS Church Temples are not open to the public, but they have a model cutout of the interior structure in one of the visitor centers. The square also has the Tabernacle where you can enjoy free choir and organ performances if you visit at right time. We missed the performances, so we had to settle for walking around in the compound. The impressive organ inside the The Tabernacle. Too bad we missed the performance. 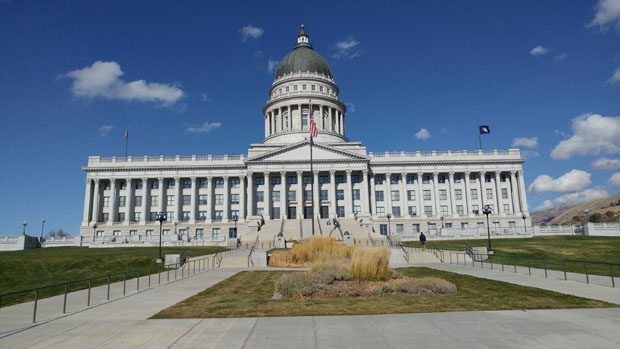 Utah has a pretty big capitol building. In addition to Temple Square we also walked up the hill to Utah’s State Capitol. It’s a big and impressive looking building built in the traditional domed style. The Capitol is located outside of the area with the tall buildings, so we got a pretty nice view of the surrounding mountains from the grounds of the Capitol. An interesting fact about Salt Lake City is that the first Kentucky Fried Chicken (KFC) franchise store is located in the city. We all know that KFC was founded in Kentucky by Colonel Sanders, but the first franchise store was opened in Salt Lake City by Pete Harmon. We visited the location, and outside you’ll see a statue of Colonel Sanders and Pete Harmon. 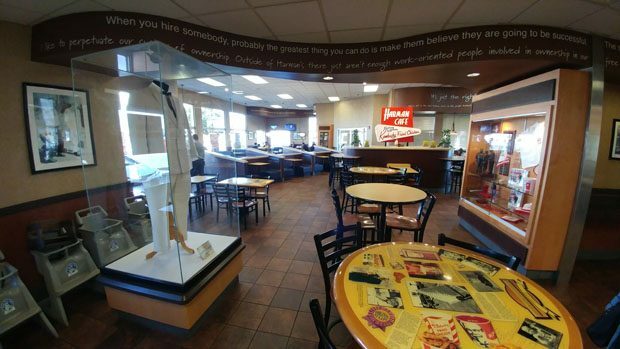 The original building at the location was demolished years ago, and what was built in its place is a fully functioning KFC which also serves a museum with various KFC memorabilia. We had the KFC buffet for lunch. It was the first time that I’ve had the KFC buffet, and it’s a pretty good deal if you got a big appetite. All you can eat KFC fried chicken, mashed potatoes, coleslaw, fries and pudding… you can definitely fill up on that. The Great Salt Lake and some of the salt flats near the shore. Of course, a visit to Salt Lake City would not be complete without visiting the namesake of the city: the Great Salt Lake. The Great Salt Lake is the remnant of the ancient Lake Bonneville, and its high salinity (considerably higher than that of the ocean) comes from the fact that it’s a terminal lake with no outflow. I found it interesting that Salt Lake City was not right on the shores of the Great Salt Lake. 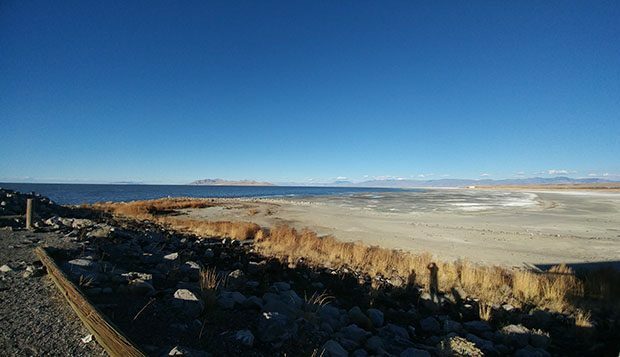 We drove 20 minutes to Great Salt Lake State Park, which is a small boat launch/marina on the shores of the lake. We stepped down to the shores and since the lake level was low, there were an area of dried salt flats for us to walk around. I had a little taste of the water, and it was definitely very salty. The lake is too salty for fish to live, but brine shrimp and brine flies thrive in the environment and they in turn provide food for many bird species that come through the area. Continuing north from Salt Lake City, we drove into Idaho. The only thing I knew about Idaho before visiting was Idaho potatoes. I didn’t even know that Idaho was considered part of the Pacific Northwest until I looked it up during this trip. 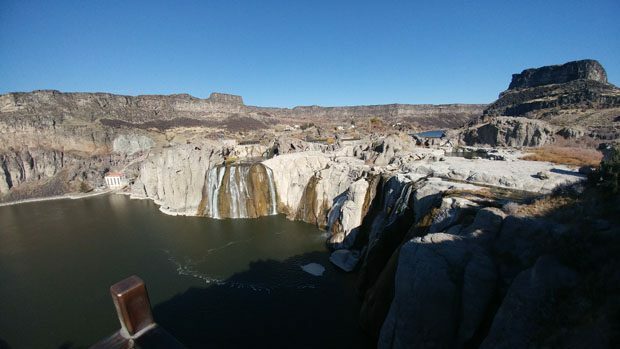 During our drive through the state, we stopped by Twin Falls to see Shoshone Falls, a large waterfall on the Snake River. Shoshone Falls is known as “the Niagara of the West”, but during the day of our visit, there wasn’t much water flowing in the river so it didn’t quite look like Niagara Falls. I’m sure it’ll look more impressive when there’s more water in the river. 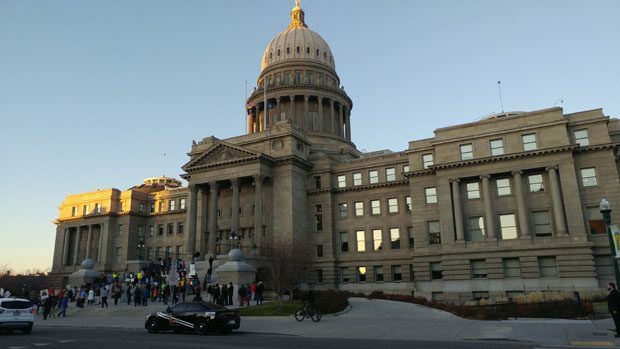 We continued on to the state capital Boise and we took a stroll around downtown. We saw the state capital and saw an anti-Trump protest. Boise is not a big city, but the downtown seems decent with that mid-small city flavor. We didn’t make any tourist stops after Idaho. We continued into Oregon and stopped in Portland so we can got shop at the clothing outlet stores, and then hopped on the I-5 up to our final destination of Seattle. In total, the trip was 12 days and 11 nights, and I drove over 3400 miles across the United States. It was a trip of a lifetime, an item checked off the bucket list and a fond memory that I will always have. Along the way we saw places that were beautiful, bizarre, interesting and unique. It was a great trip, but by the end I was getting a little tired of being on the road, and I was glad that we’ve finally reached our destination safe and sound. The United States is such a vast country with such diversity in people, culture and landscapes, and there is still so many places to travel to. With my new job, I have some more vacation days on my hands, and I’ll be sure to use them wisely. At the time of writing, I managed to settle down a bit in Seattle, and started going to work at my new job. It’s the beginning of a new chapter in my life, and I hope it will be better than the last one. Wish me luck, and thanks for reading.